Army recruiting at the Jobcentre. My concerns. A while ago I voiced my concerns on here about the army recruiting at Ashton Under Lyne Jobcentre. I’m sure that this is common practice at quite a few Jobcentres but no one seems to want to speak about it. When I first saw this I was very concerned. Not only because they were openly recruiting but the way in which they were doing so. He then went on to say ” you’ve got no choice you’ve got to join the army. It’s the only thing for you to do. You won’t get sanctioned”. The claimant refused saying that he would never join the army. No amount of underhand threats and coercion would work. They didn’t believe in war and certainly didn’t want to be put in a situation where he might have to hurt someone. He walked out of the Jobcentre and said he had never seen anything like this before. The unemployed are not to be used by army recruiters like this. If someone wants to join the army there are enough army recruitment offices and mobile pop up stands around for people to enquire at if they should wish to. It’s very concerning but sadly not surprising that the DWP are facilitating this. It would solve a problem for them and they don’t care about the consequences. Many people who have to use a Jobcentre are vulnerable and should not be taken advantage of in this way. The recruiters themselves were very young and were certainly not experienced in the complexities of the DWP. Today I saw this article and it indeed rang alarm bells in my head. Why are the army recruiting so desperately these days? We aren’t officially at war with anyone but I’m sure something could well be planned. My knowledge on this subject isn’t vast but I do know that war is wrong and problems should be solved through talking and peaceful agreements and not the killing of innocent people. Suicide is already at an all time high especially amongst claimants and those who fail the DWS cruel back to work medicals which are conducted by companies such as ATOS and Maximus. Both are ran in much the same way. It’s a massive worry and encouraging vulnerable people to join the army will only make things worse. The army is not the answer to sanctions. I thought this especially poignant because rememberance Sunday will soon be upon us. Do we really want to have to remember more fallen soldiers? Too many have fallen already and the most vulnerable in society should not be used as cannon fodder for the elite. But we are fighting a full on war against the poor and working poor and we do need to fight this. No guns or bombs needed. We do need to take a stand like I have said before. Tell this government that this is not ok.
My deepest condolences to those who work in the steel industry and have lost their jobs. This should not have happened. I’m disgusted at this governments plans to cut tax credits. I will be a victim of this and have already received my warning letter from them. I can see it being a very cold winter if this isn’t stopped. Please support the campaign to stop the trade union bill going though. As a very active trade unionist the implications of this are terrible. We will be fighting this though. If you aren’t in a union please join one. If. You are not working then you can join unite in the community. Sick note refused under government new scheme. Tax credit bill delayed in The House Of Lords. Yes..my son fell under the spell of the army tv advertisements! He was 16 and they make it look like an adventure holiday. The message of ‘being someone of worth, as opposed to being a lost individual with no worth.’ The filming is similar, in parts, to online game scenery and scenarios. Thankfully he changed his mind (helped by persuasion and threats of many underhand tactics to stop him from me). I have seen them in the jobcentre..looking organised and authoritarian compared to the chaotic, disconnected atmosphere they’re in..they seem like the ones in the know..who’ve got it together amongst lost stragglers. Perfect positioning for their heartless recruiting tactics. 16 yr olds feeling it’s their only choice of a real job. Needs to stop. It really does need to stop. A 16yr old isn’t allowed to smoke, drink or vote but is old enough to be brainwashed and killed in yet another war. Enough is enough! It is probably a cost-cutting exercise by the army only signing up recruits on a short-term contract and then spitting them out before they have served long enough to accrue any pension etc. Could well be. But it’s terrible. These people are very vulnerable and we should be protecting them instead of putting them in danger. That’s what I’ve heard theyre doing. I know people who have young adult children in the army. Like everywhere..people are getting the rough end of the stick. They don’t educate each generation on purpose. Otherwise they’d know..it’s an illegal war..made for profit..under the guise of peace. Thankfully he felt ‘out of place’ in the army and royal airforce assessments. Yet his two older brothers were supportive and told me I should be. Most of us know the Tories went to the USA to learn [and implement] their welfare “reforms”. As with all the other welfare-reform atrocities, they are now implementing the forces [to the young] as a “saviour” from penury & homelessness. Yes!!!! They probably got some more tips from the Chinese prime minister when he arrived in the uk….. How to make the uk population become brainwashed and under total control. Hang on we have the Murdoch empire to think of for that! The Quakers should be concerned about this, as peace and non war are so important to them, (I’m a Quaker attender). I know they’re very concerned at present about the militarization of schools http://www.ekklesia.co.uk/node/21818. This is so concerning and just wrong. Can someone/is anyone being sanctioned for refusing to join the army? Controversial outsourcing corporate Capita do the recruiting . 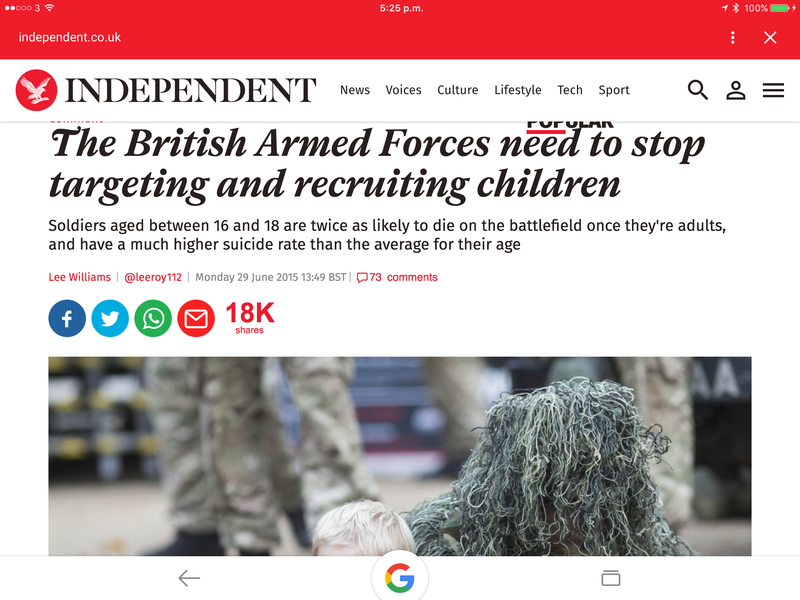 If you want things from the Horses Mouth so to speak about this issue – Google ARRSE – Army Rumour Service Forum – The UK’s largest and busiest UNofficial military website. They will say ‘You did not do all you could to find work.’ Soon people will be coerced into anything, absolute anything someone can do to be paid money, without no freedom to walk away from exploitation. We go more like a third world dictatorship everyday. I have never yet met ANYONE in favour of war and I am certainly one of those. However, the number one function of a Government is to protect its citizens. For that reason alone we require armed forces. However, those armed forces should be for defence purposes.. Waging wars in areas as far removed from our shores as Iraq, Afghanistan, Libya and Syria does not qualify as a defensive measure in my mind. My son joined the Army straight from school and he has since prospered and flourished. He has gained terrific qualifications and experience that he would not have received outside of the Army. When he leaves the Army, he will have no problems whatsoever in obtaining a first class well-paid job. However, if the allegations about recruitment methods at Ashton-under-Lyne Jobcentre are true, these need to be investigated and the practice halted immediately. Joining the armed forces should be a completely free choice – not a choice, influenced by fear or intimidation. Exactly. It’s about free choice. Your son wanted to join and he was fit enough to do so. Now I do have photos somewhere to prove that this is happening and indeed I have had reports of this happening in other Jobcentres as well. It’s not a one off. By all means recruit in the traditional way, but not in places where vulnerable people are concerned. It’s wrong and I do feel that claimants are being taken advantage of. The television advertisements add to the encouragement (or entrapment). Soon there will be laws..if you are out of work for so long..into the army you go..In order to be a ‘good citizen’ who is not a ‘drain on society’. Dangerous dialogue. Why not make them have degrees before enrolling, bit like thug police! Letting folk have an educated choice is the best way rather than being coerced into doing something because they are living in extreme bullying. This is too important not to have the facts straight, so my question is A) did the army approach this claimant on DWP premises, which would justify the use of the phrase ‘facilitated by the DWP’? Yes of course. As stated they were inside the Jobcentre and have also been doing this at other Jobcentres up and down the country. This was in NW London. They looked almost as appealing as a team of fire fighters do, to a young teenage boy.